These are great vintage earrings, and pierced too!! 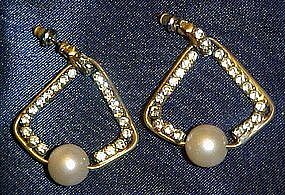 Gold tone frames are studded with crystal rhinestones and each earring has a large faux pearl in the center. Post backs. Great condition. Measure 1 1/2" long and 1 1/8" wide/ All stones intact!